Mr. Halligan leads the Mohawk Marching Band in front of the school during the Booster Day Parade. Thanks to everyone who helped make our 2nd annual Car Wash a success! Students earned over $300 to help fund their trip to Virginia this spring. The MMA had a very successful pie sale on Booster Day! Thanks to everyone who made that event possible - and thanks as well to everyone who bought a slice of pie (talk about a win-win)! The Mohawk Warriors Marching Band was proud to march in the Booster Day Parade, and we’re already looking forward to next year. Select Chorus gave their first performance of the year at the Booster Day Pep Rally! Many thanks to all who baked potatoes and worked at the Baked Potato Booth at this weekend’s Fall Festival in Ashfield. 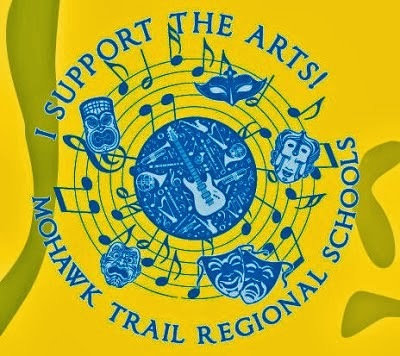 On Sunday, October 12 Mohawk Music alumna Tess Burdick performed at the Fall Festival and then at 11:15am Mohawk's unplugged student rockers, Acoustic Toast, performed, followed by our Select Chorus. Now we’re looking ahead to more exciting events this month: Bake and Busk and Cantate! Jesse Porter-Henry, Assistant Principal, buys a slice of pie from MMA President Sherry Taylor at the Booster Day Game. High School Music Students will be fundraising for their trip to Virginia with a special bake sale and busking event in Shelburne Falls on Oct 19 from 10am-1pm. “Busking” is performing on the street for donations. Students will have a bake sale tent across the street from McCuskers, and will also be singing songs and playing instruments for donations. Please stop by and show your support! Cantate! – Friday, October 24! - You’re invited! I would like to invite you to join me and the High School Concert Chorus at the Cantate Choral Festival at Keene State College, October 24. It would be delightful to have you with us! This is a fantastic event for our students, and I think you would be thrilled to experience it first hand. Choirs from all over New England come to Keene State to participate in the festival, where they perform and receive on-stage coaching from college music faculty. The college choirs also perform, and the event ends with an "all sing" in which students from all participating schools perform together as a massive choir. It's a spectacular, inspiring event! This is a great focal-point for my classroom instruction, both before and after the event. It's a very rich, authentic learning experience for our students. Cantate is scheduled for 9am-1pm on October 24 at Keene State College. You are welcome to come with us on the bus (leaving Mohawk at 8am, returning at 2pm), or you can drive separately if you need to come late or leave early (you will just need to pick up a visitor parking pass on campus). Once the performance schedule is set for the day, I can let you know what time our school will be performing. Feel free to get in touch if you have any questions about this. I hope you will consider joining us! High School Band and Chorus members planning to participate in the annual competition trip will need to make a deposit of $50 by October 17. We will be traveling to Williamsburg, Virginia over April Vacation to compete in the Worldstrides Heritage Music Festival, visit historical sites, attend concerts by the Virginia International Tattoo, and spend a day celebrating at Busch Gardens amusement park! Parents are eligible to chaperon, too! Please note: the Winter Concert has been moved from December 10 to December 9. Still 6:30pm. Ms. Glover directs the Middle School Chorus performance at a Mohawk Music Concert. Students should have received information on the Citrus Fundraiser. This is a fundraiser that Mr. Halligan has set up for the High School students as a way to minimize their Virginia trip payment. Mr. Halligan has offered for Middle School students to join in on this as well, as a way to help with the cost of our Six Flags field trip in May. The Music Association has once again generously donated the $29 per student performance fee for each student, as they have done in the past. This leaves the fee for the ticket to get into Six Flags, as well as the bus fee for the day. These 2 items usually total between $45-$60. This fundraiser is a way for students to work to individually reduce this payment, and, if students sell enough citrus they may even be able to go for free! The orders are due by October 24th and fruit will arrive in time for Thanksgiving! The following are links to my class pages, the music department Facebook page, the MMA webpage, and the MMA Facebook page! Please visit any of these sites for more information about our program!